There are no unwanted children, only unfound families. The Heart Gallery of Palm Beach County helps bring together precious foster children and loving, adoptive families. Professional photographs reveal the souls of these beautiful children, offering families a glimpse into their hearts longing for love and stability. 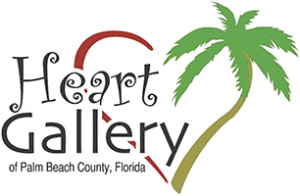 A program of Children’s Home Society of Florida, the Heart Gallery of Palm Beach County connects children available for adoption with loving families. Through this traveling photographic exhibit, portraits of our precious children are displayed throughout the county to offer families a glimpse into their hearts. The Heart Gallery exhibit raises awareness of local children longing for a forever family. Most of these children have been removed from their biological families after suffering abuse, neglect or abandonment…they all dream of the day they’ll join a family through adoption. Adoptive families forever change the lives of children who long to be safe, loved, accepted and secure. When you donate to support the Heart Gallery of Palm Beach County, you provide hope to local children longing for a family of their own. You provide the safety, love, shelter and necessities for youth in foster care who dream of the day they’ll finally be home…forever.